Yay...It's Friday :-) It's also the start of a new challenge over at That's Crafty. The theme this fortnight is Fly Away, projects to contain wings, birds etc. Here is my DT Inspiration. Time was a little short for me so I made a fairly quick and east tag. 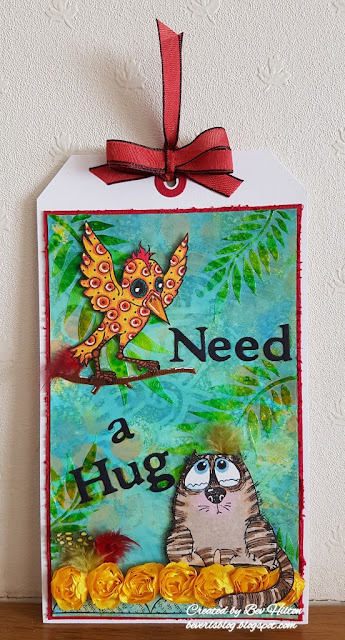 I do like making tags and so love these characters so thought I would team them up for some loving hugs. You can see my tag over on the challenge blog HERE along with more inspiration from the rest of the design team. That's Crafty 8 x 8 Stencil...Big Floral. Katzelkraft stamp...Les Gros Chats 01 - SOL072. Prima Stamp...Border. Unsure of name as not in packaging but any would do. Sizzix Thinlits Die...Susans Garden 659252. Alphabet Die...Make unknown but any would do. Distress Oxide Inks...Salty Ocean, Lucky Clover, Twisted Citron, Wild Honey and Spiced Marmalade. That's Crafty all purpose glue. 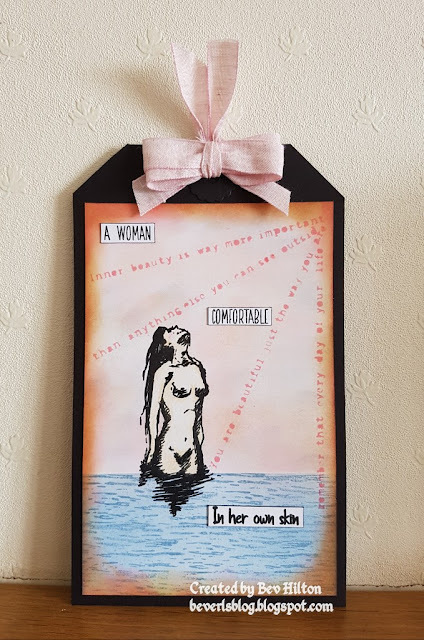 I began by layering up the distress inks on to smooth white card, making sure I dried each layer before adding the next. Give the card a spritz of water here and there as you go. Once happy with the colour, take the 8 x 8 stencil and spritz with water. Make sure the edges are wiped dry before laying this down on to the card. Make sure you have some paper towel to hand to dab up the excess. Lift the stencil, quick dab again with the paper towel and blast with a heat tool. This will leave a soft print on the card. I love this technique as it is so effective. Now take the dinky stencil and apply the spiced marmalade lightly through the stencil randomly. Take the PaperArtsy stencil and translucent embossing paste and apply the paste through the leaves over the card. Blast with a heat tool until it starts to bubble to add texture. I love the look this gives. Stamp the bird and cat onto some mixed media card and colour with the brush markers. Cut these out carefully. Stamp the border across the bottom the the card and glue the flowers across the bottom just above the stamped border. Die cut one of the branches from the thinlits die set using brown card. Glue the branch into place and using glue gel, mount the bird in place on the branch. Do the same with the cat and place him just above the flowers with his tail trailing over. 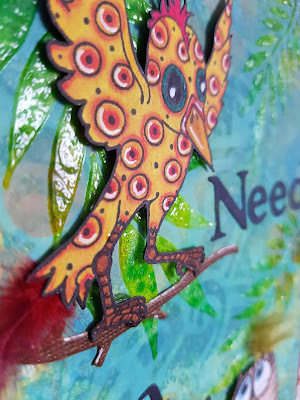 Add some highlights to the bird and branch using the signo pen. Die cut the letters using black card and glue into place using the all purpose glue. Add a couple of feathers to finish off. Mount your finished piece onto red card before mounting onto a white tag base. Punch a hole for the ribbon. Die cut a couple of hole reinforcements and tie some matching ribbon. I hope you like it and that it may have given you some inspiration. So come and join in the fun over at That's Crafty. I would love to see some crafty projects and don't forget that you could be in with a chance of winning the £20 gift voucher to spend at That's Crafty. You can see the challenge rules HERE. Get your crafty mojo on and join in the fun. All for now. Have a great weekend and hope to see you agin soon. I love the story you tell, and the amazing background you have created , both with the wet "stamp" and your fantastic leaves - so gorgeous !! Amazing detailed background on your tag Bev and really love the clever design with the bird and cat. This is such a cheery Tag Bev, highly detailed and so colourful. If only life could be happy as the scene you have created with one Big Hug..
Have a fabulous weekend lovely.